'Community' Goes 'G.I. Joe' In First Photos from "G.I. Jeff"
This past week we saw 'Community' returning to its Dungeons & Dragons roots with latest concept episode "Advanced Advanced Dungeons & Dragons," but its next gimmick will prove far more ambitious. 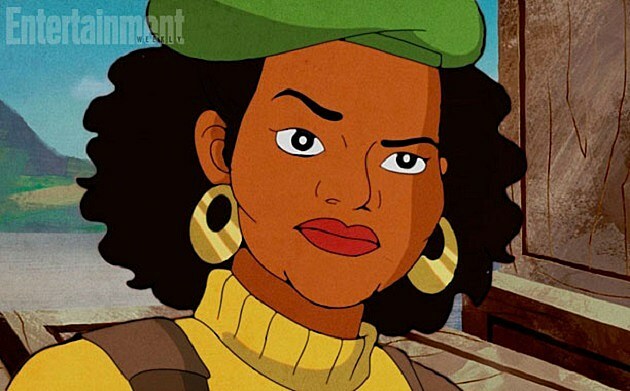 See the cast of 'Community' done up in the animated stylings of 'G.I. Joe,' including "Tight Ship" Annie and "Buzzkill" Britta in the first photos from upcoming installment "G.I. Jeff"! Entertainment Weekly snagged the first photos and details from the animated installment, which will air April 3 so as not to go up with the NCAA tournament of March Madness. In the installment, which features Jeff (Joel McHale) as "Wingman," Alison Brie's Annie as "Tight Ship," Gillian Jacobs' Britta as "Buzzkill," and Yvette Nicole Brown's Shirley as "Three Kids," the study group finds themselves with a mystery to solve that ties in thematically to the '80s action franchise. [G.I. Joe] was something from our childhood that was very important to us and we had fond memories of it, and we thought it would be a cool way to do another animated episode. Like all Community episodes, it takes on a certain style. This one has a very specific story reason for it. I don’t want to give too much away, but our characters find themselves on a Wizard of Oz-type journey through the world of G.I. Joe. … There’s a mystery that Jeff in particular has to get to the bottom of. 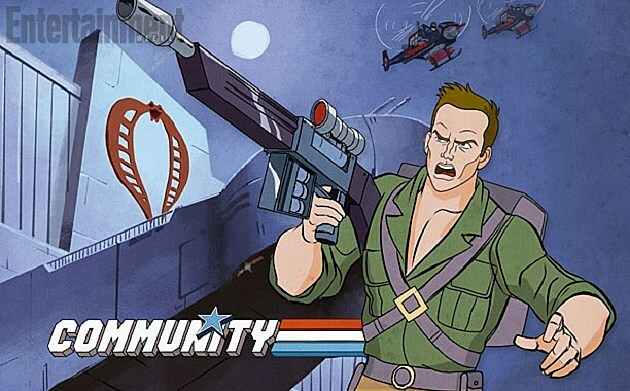 We'll bet dollars to doughnuts the transformation has something to do with Abed, but in the meantime, check out the 'Community' cast done up as 'GI Joe' above and below, and tell us what you think of the latest concept episode in the comments!